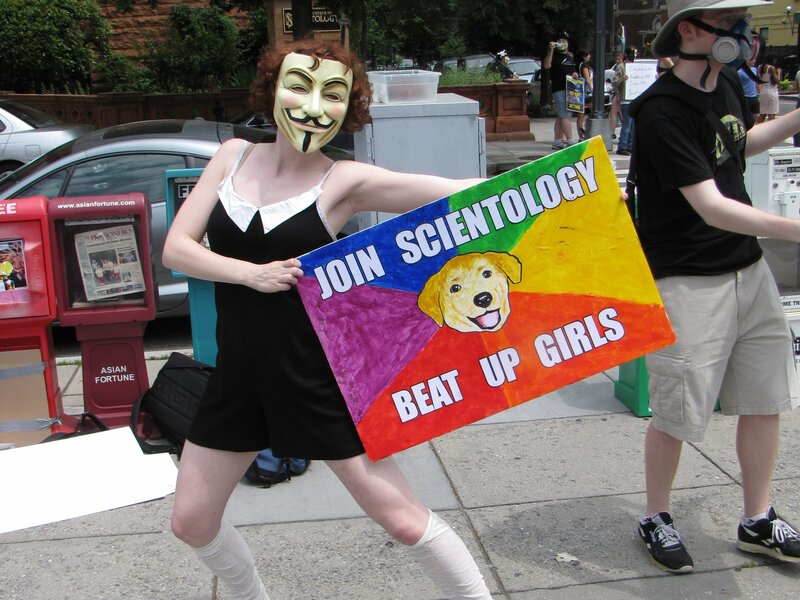 Beret demonstrates this point with her “Join Scientology, beat up girls” sign. John McNonymous also demonstrated this point with an add-on to an existing sign. 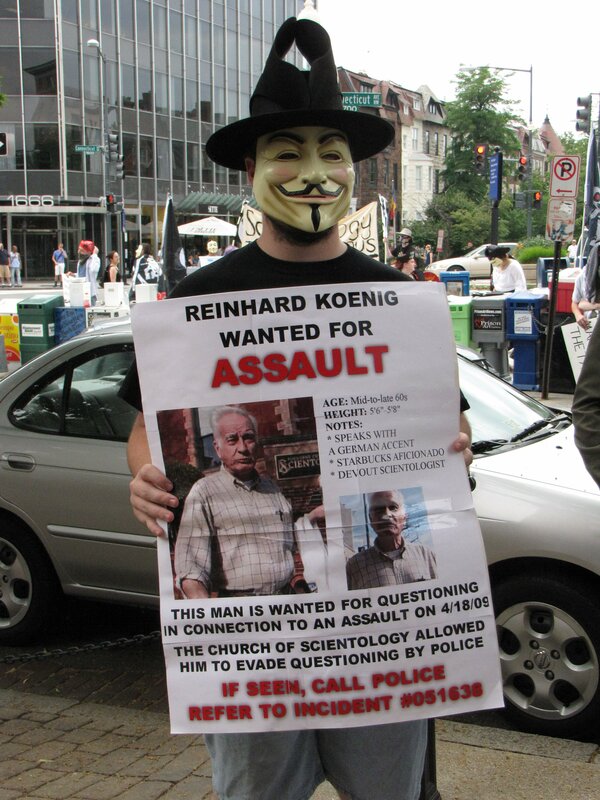 Meanwhile, Enturb held up a homemade wanted poster for Reinhard Koenig, the alleged kicker in the Ron Jeremy incident, who, at the time this photo was taken, was still at large. 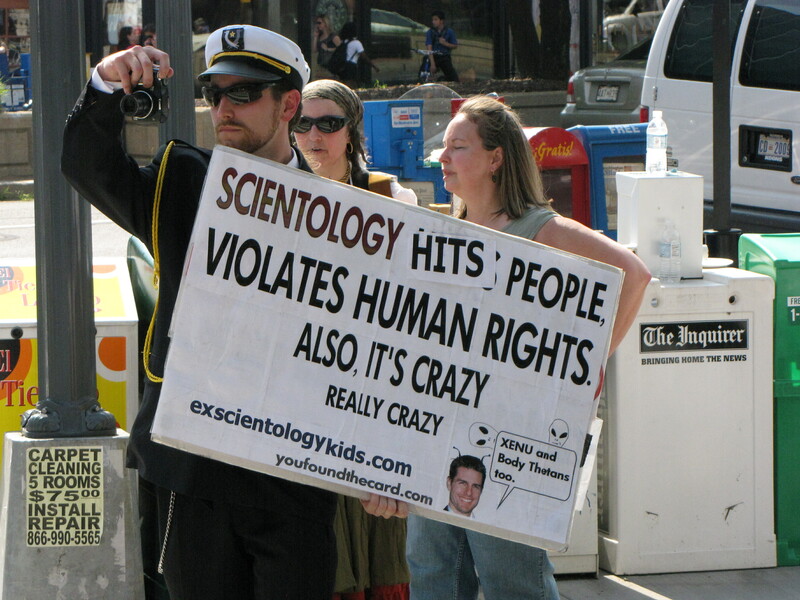 I still find it amazing how Scientology finds it useful to engage in illegal activities to try to scare us off. After all, most groups, when targeted by demonstrators in Washington, don’t even bother getting involved, leaving the cops to handle the demonstrators. Not Scientology. 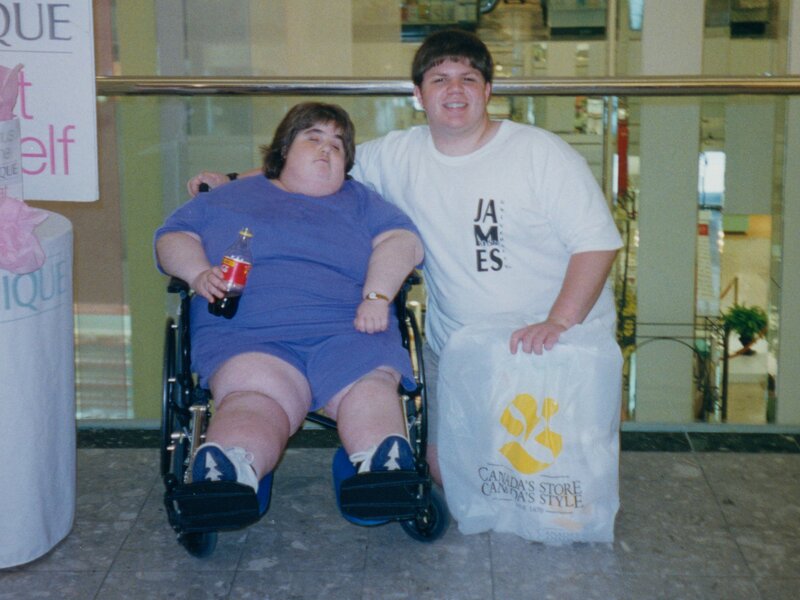 They used to just try and screw with us, but now they’ve graduated to assault and battery. All in all, it’s not very becoming for a supposed religious group. This raid also marked the first time in about a year that we had a large banner. 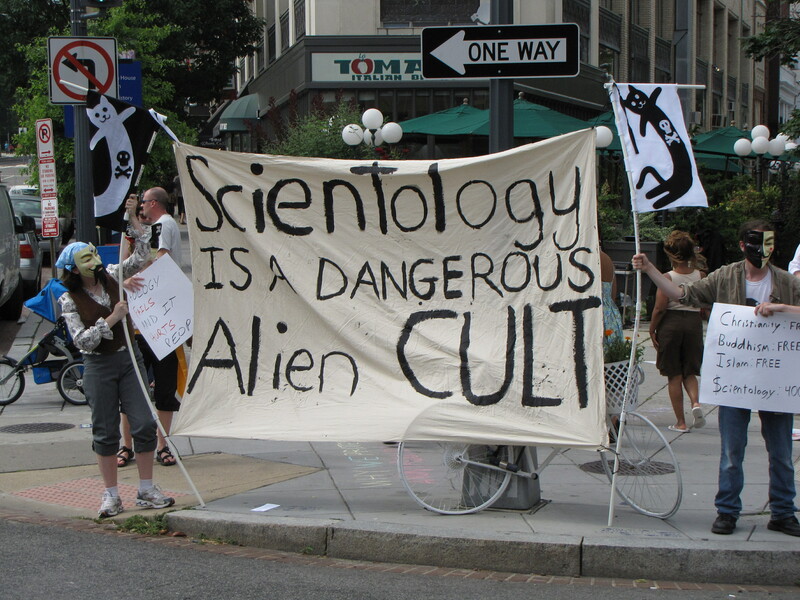 While our last banner in 2008 read “BOOOO SCIENTOLOGY”, this one read, “Scientology is a dangerous alien CULT”. We also got good activist press coverage at this raid! Luke, whom many of you have seen in photos from other demonstrations, swung by our raid while covering the Capital Pride events for DC Indymedia. Luke takes a few photos of our raid, and interviews an Anon. 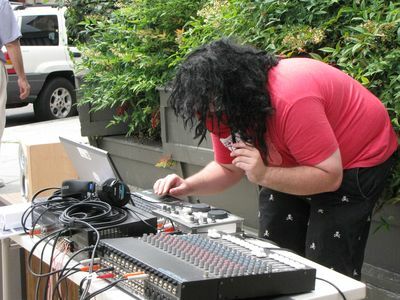 Luke’s work ultimately led to this article on DC Indymedia about our raid. This raid also had a feel similar to some of our earlier raids. 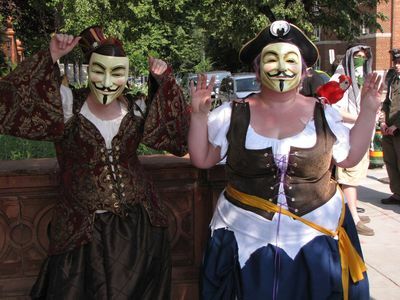 Some Anons came back to raid with us again, plus we had the big sound system like we did for early raids. 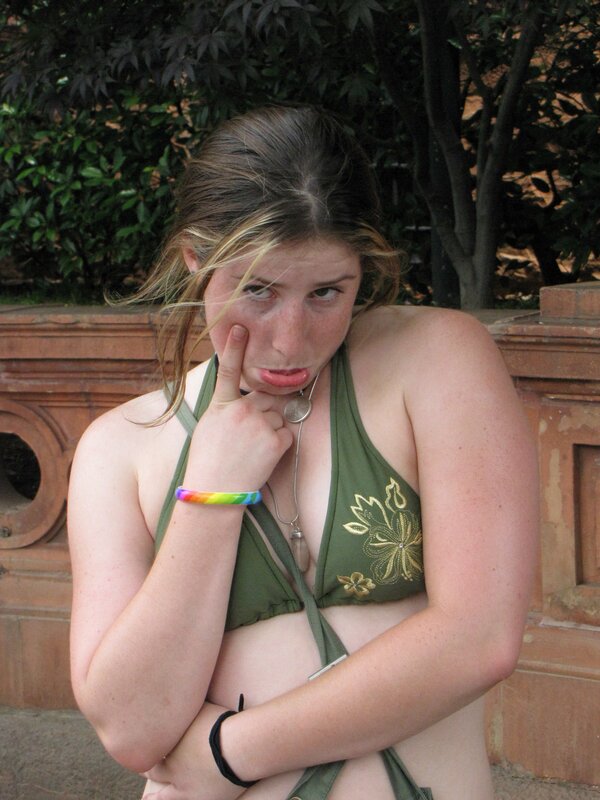 Heidi also made it to her first raid after way too many months’ absence. 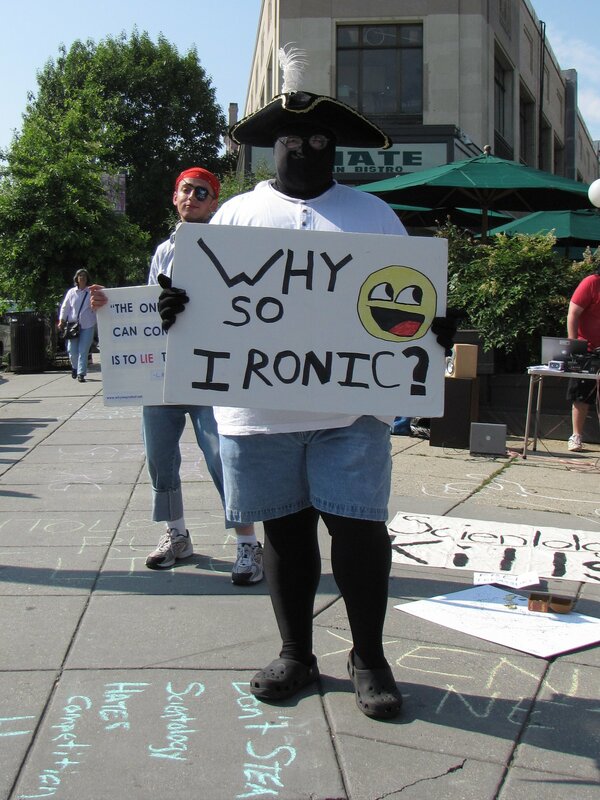 One person who was noticeably absent was WalkingStickMan, whose trademark phrase is “Why so ironic?” He was out graduating from high school on this particular occasion. He may not have been there, but his sign was, and we made sure to put it to good use. HT and Purple Hair Anon dance to pirate-themed music. Meme sings a sea shanty written specifically for this raid. 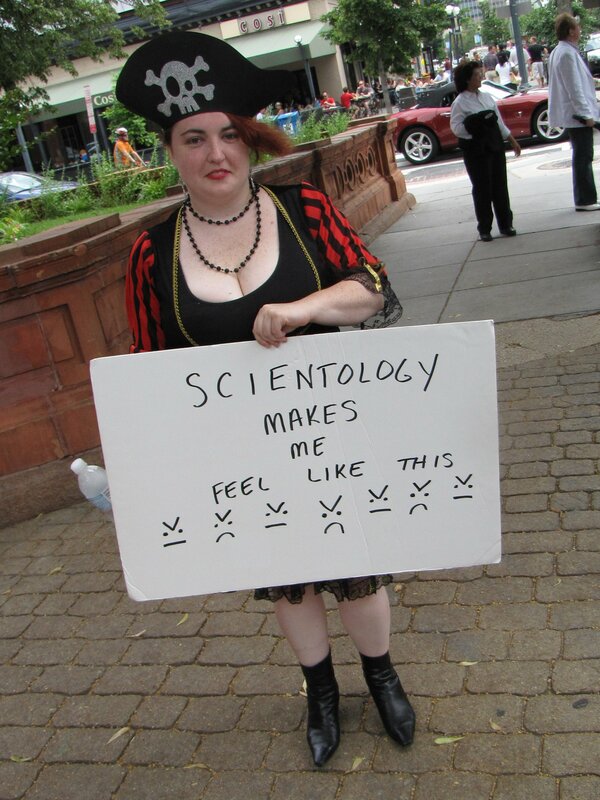 “Sylvia” refers to Scientology spokesmodel Sylvia Stanard, who never did make her token appearance this time around. As you can see, the atmosphere was light, as word came out that the police had caught alleged attacker Reinhard Koenig. And then as the raid neared its close, guess who showed up! It was none other than WalkingStickMan, who, after going to graduation and post-graduation activities, came to our raid. Beret gives WalkingStickMan a congratulatory hug for a job well done. And that was basically it! After the raid, a bunch of us went to Bailey’s for our usual after-raid dinner and lulz, and all in all, a fun time was had by all. 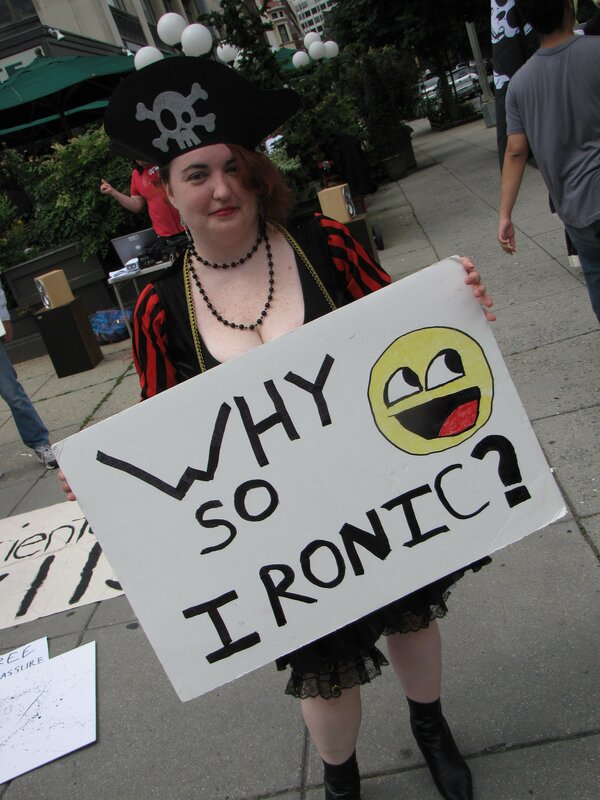 Web site: Anonymous, ex-Scientologists protest "SeaOrg"
Quote: So all in all, not a bad day. And hopefully, we showed the Scientologists that despite their change from "Ignore Tech" (our term) to "Assault Tech" (my term), we will not be swayed. And they're still practicing "Curtain Tech", where they hang a maroon curtain over the window on the Org's front door and draw all the shades on the west side of the Org. I guess they figure that if they can't see us, we aren't really there. Kind of silly, if you ask me.